Holly Hobbie was an artist specialising in drawing greetings cards, lending her name to the characters she drew, which were later issued in doll form. During the 1960s, people became intrigued by her designs featuring a little girl, facing sideways, dressed in a long patchwork frock, with a large bonnet totally obscuring her face. This pose tended to create an urge to see the expression which lurked beneath the brim. Grannies, especially, adored this nostalgia theme, imagining it was their granddaughter lurking under that floppy bonnet, and the whole concept happily coincided with the fashionable look of the day – long, floaty dresses, small prints, Laura Ashley, country style, femininity and pastel shades. Holly Hobbie created her designs for the American Greetings Card Company for many years, featuring children in idyllic settings, each illustrated by a motto such as ‘Life’s greatest blessing is a happy heart’, ‘Happiness is found in little things’ or ‘Start each day in a happy way’. The designs appeared not only on stationery items, but on products such as kitchen towels, oven gloves, plates, cups, aprons, bed linen, china ornaments, trays and, of course, as dozens of different dolls. Many of these were rag dolls, as befitting the nostalgia theme. Today, Holly Hobbie lives in Conway, Massachusetts, and is a successful author/illustrator of picture books featuring the adventures of two pigs called Toot and Puddle. Dolls representing Holly Hobbie have been made by several companies over the years, including Knickerbocker, Tomy and, most recently, Ashton Drake. During the 1970s a Holly Hobbie made from a very soft thin rubbery vinyl was issued by the American Greetings Corp. This doll had barely-there features, a round head, straggley hair and tiny eyes. She looked rather strange. 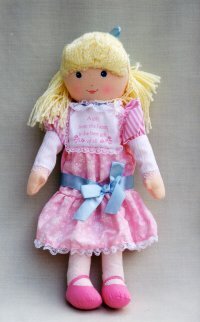 Knickerbocker created a whole range of rag dolls in various sizes, and, as well as Holly Hobbie, there were friends such as Amy, Heather, Carrie, Robby and Grandma. Amy tended to wear green, Heather pink or beige and Carrie, red. Robby was a little boy in blue striped dungarees, while Grandma, naturally, was an old lady doll. As well as the rag dolls, vinyl types were available – one unusual one stood just 6″ tall, but wore an enormous skirt. Underneath the skirt was a three-roomed dolls house, complete with Holly Hobbie-style furniture and accessories, such as a gramophone with a horn, a rocking chair, a butter churn, a kitchen dresser and a round table. Tomy introduced a range of Holly Hobbie dolls in 1989, featuring some beautiful rag types 16″ high, dressed in pastel-coloured dresses, each bearing a message such as ‘Make each day a sunshine day’ and ‘A gift from the heart is the best gift of all’. The box stated ‘Every day is a Holly day’. 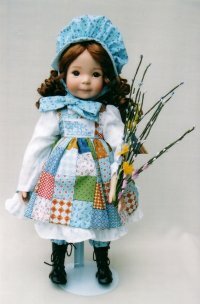 During the 1990s, Holly Hobbie was revamped again, this time by Knickerbocker, appearing as a vinyl, soft-bodied doll with a snub nose, cheeky smile and masses of curly hair. 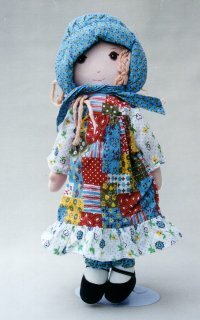 She wore a long patchwork frock and matching bonnet, available in several colourways. Smaller versions were sold too. The recent Ashton Drake issue of porcelain Holly Hobbie dolls was probably the most delightful representation of the character ever produced. Created by Dianna Effner, and standing 16″ high, they represented the four seasons. Autumn, the first to be released, showed the little girl in her famous patchwork dress and bonnet clutching a flowering twig. The next in the series, Summer, had Holly dressed in patriotic red, white and blue, holding the American Flag, while Winter had her in a red dress and Spring wore green. These dolls had delightful expressions – a combination of a shy smile and a cheeky grin – and the detailing on the costumes was excellent.